Tzaneria beach: Tzaneria is a coastal settlement situated 7km from Skiathos Town. The beach is well-organized offering three rows of umbrellas and sundecks as well as a water sport center. 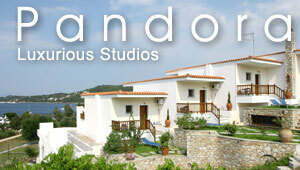 It is surrounded by vast greenery and high pine trees, a typical feature of Skiathos. There is plenty of parking space as well. Surrounding the beach, there are many options for accommodation and several taverns with delicious flavors from the local cuisine. Due to its short distance from the town centre, it becomes very crowded with tourists.